The Internet Archive and APPC announced a collaboration to help journalists and the public better understand how TV news and talk shows present the presidential debates and what the public learns from them. In an op-ed in the Washington Post, Kathleen Hall Jamieson said debates were an essential way for voters to learn about the presidential candidates, and that Donald Trump should participate in all three debates against Hillary Clinton. 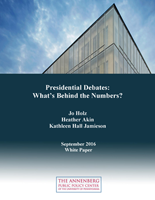 Presidential Debates: What’s Behind the Numbers?